Last week I interviewed a real, live, professional race car engineer for the famous Andretti racing team, whose workshop and garages are based just outside the equally famous racetrack at Indianapolis. And what’s the first thing I learned? Mechanical engineer Judith Henzel got her degree in Wiesbaden before going to work for TE Connectivity, a huge 75,000-person company that makes… well, a lot of things. As big as it is, TE is relatively unknown unless you make aircraft or industrial robots… or racecars. You see, TE and Henzel both specialize in high-reliability connectors for harsh environments. The fact that she’s a lifelong motorsports fan is just a bonus. Henzel is normally a full-time employee of TE in Germany, but she’s been seconded to the Andretti Formula E race team in the USA for the six-month racing season. She’s what you might call an embedded engineer. Her job is to act as conduit between the producer (TE) and the consumer (Andretti). 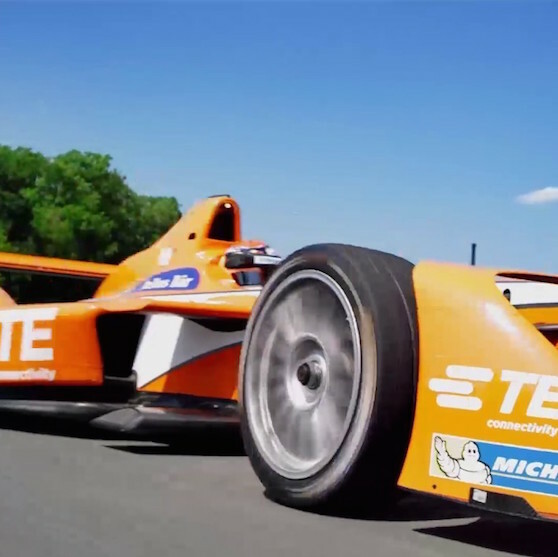 Formula E is the international series for all-electric racecars. All the competing teams currently run the same chassis, with similar batteries and motors, but the rest of the car – sensors, data-acquisition systems, telemetry, and so forth – are custom-designed. Each team has its own ideas about how to tweak the car, and Andretti relies heavily on TE for that technology. Hence, the personnel sharing. TE provides both connectors and sensors. Henzel wouldn’t say how many sensors are on the racecar – that’s classified information – but it’s likely several dozen. Accelerometers are mounted everywhere to measure the yaw, pitch, and roll of the car during a race. Pressure sensors measure gearbox lubricants, coolant pressures, tire pressures, and airflow over the bodywork. Temperature sensors perform the obvious function, keeping track of battery temperatures, coolant temperatures, ambient air temperatures, and the driver’s body temperature. It’s hot work driving an electric car on the streets of Buenos Aires in the summer. Connectors are a unique challenge for racecars, particularly all-electric ones. There are the obvious high-voltage connectors for battery packs, but also the myriad connectors for sensor networks, telemetry, and control systems. Any and all of these have to be removable and replaceable, ideally within a few seconds and without specialized tools. Yet they also have to withstand constant vibration, heat, cold, and corrosion. Oh, and if they can be made light and cheap, that would be nice too. Henzel points out that all cars have hundreds of connectors, but “series production cars” (as opposed to custom-built racecars) don’t have the same requirements as racers. Road cars don’t have their wiring harnesses connected and disconnected hundreds of times. They’re clipped together once at the factory in Detroit, Munich, or Hiroshima, and that’s it. Road cars also don’t usually see temperatures much above 120 degrees F. For the race team, anything below that gives them practically a day off. The lessons learned from racing filter back to the factory and eventual incorporation in TE’s product lines for aircraft, normal automobiles, and industrial equipment. From TE’s perspective, Andretti is a mobile shake, rattle, and roll test jig. The race team subjects TE’s sensors and connectors to as much abuse as they were designed to handle, and then some. If they can survive the crowded confines of a Formula E chassis, they can probably survive anywhere. The job comes with its own perks – or downsides, depending on your interests. At one of the first races of the year, the car crashed heavily into the barriers and had to be towed back to the pit garage. All the mechanics dove onto the car, hoping to repair it in time to finish the race, Henzel included. The team needed the help, and she was as knowledgeable as anyone about the car’s internals. During a normal race weekend, however, you’ll find Henzel inside the pit garage trying to keep her hands clean. She monitors real-time telemetry streaming off the vehicles and contributes to battlefield decisions regarding reliability issues. After the races, she and the rest of the team look at ways to improve the car and, by implication, TE’s sensor and connector products. Next time you watch a Formula E race, look in the Andretti team garage for the bright orange shirt, the radio headset, and the big grin. So, following up on Susan Fowler’s paper, did you ask questions about her take on women in engineering, and racing? Nope. I wasn’t really talking to Judith as a woman, per se, but as an engineer with a cool job. Her chromosomes didn’t really enter into it.